Elexon Mining works with customers and collaborators around the world. From Brendale, in the outer northern suburbs of Brisbane, the technology and systems developed by Elexon and its partners benefits mining operations as far afield as Northern Canada and the remote interior of Chile. Networked Smart Markers (NSM) are novel subsurface deformation monitoring devices able to transmit data wirelessly through the rock mass. They have the potential to overcome some limitations of currently available technologies: short lifespan, limited application depth, limited number of sensors per borehole among others. Two mine scale trials were conducted to assess the reliability of wireless data transmission through rock and the ability to get qualitative subsurface deformation measurements. The System performed successfully fulfilling both objectives of the trials and allowing the installation procedures, data acquisition and management and communication protocols to be tested and validated. 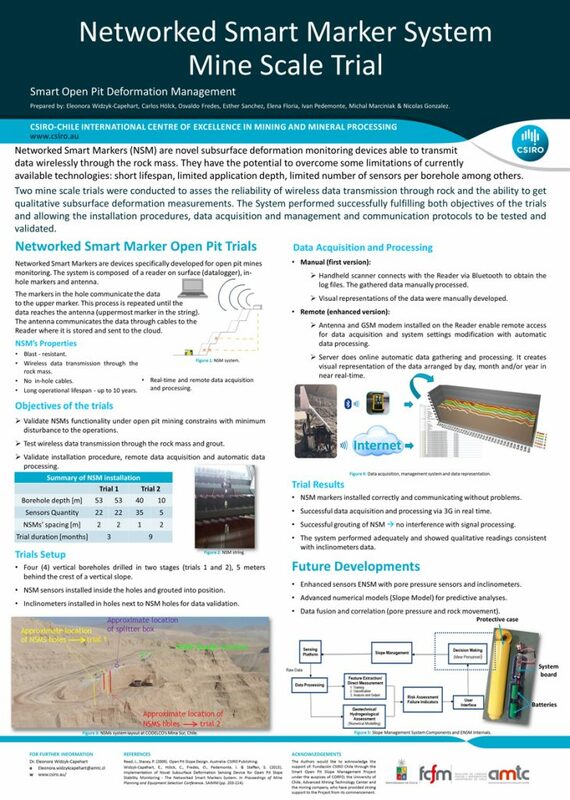 This project is a collaborative effort and the Authors would like to acknowledge the support of: Fundación CSIRO Chile through the Smart Open Pit Slope Management Project under the auspices of CORFO; the University of Chile, Advanced Mining Technology Center and the mining company, who have provided strong support to the Project from its commencement. In collaboration with Rio Tinto, CRC Mining and Newcrest, Elexon Mining has developed the Cave Tracker System. This world first system allows mine operators to see movement in the cave in near-real time – a world first achievement realised through the power of working together. Successful Sublevel Shrinkage at Mt. 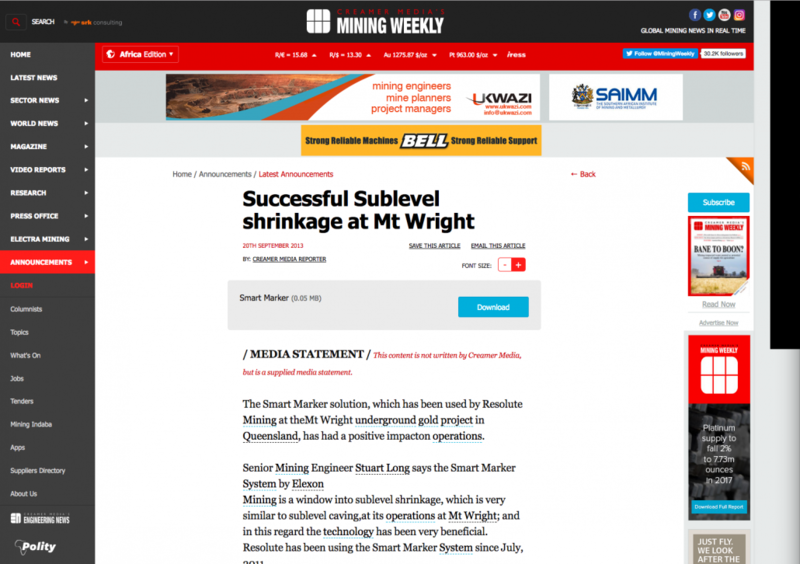 Wright: The Smart Marker Solution, which has been used by Resolute Mining at the Mt Wright underground gold project in Queensland, has had a positive impact on operations. Senior Mining Engineer Stuart Long says the Smart Marker System by Elexon Mining is a window into sublevel shrinkage, which is very similar to sublevel caving, at its operations at Mt Wright; and in this regard the technology has been very beneficial. Resolute has been using the Smart Marker System since July, 2011. “The Smart Marker System has enabled us to make improvements to our drill and blast activities, which has resulted in better ore recovery,” Long says.